AMHERST— Seconds away from winning his third Western Massachusetts boys basketball championship, Sabis senior guard Nelson Zayas checked out of the game and received a standing ovation from the Bulldogs cheering section at the Curry Hicks Cage. SABIS' Nelson Zayas drives to basket on his way to victory. After scoring a game-high 24 points to lead top-seeded Sabis past No. 3 Hoosac Valley, 71-56, Saturday afternoon, Zayas walked over to the water cooler for a drink and joined with coach John Williams in an embrace. "I just told him I love him,” Williams said. “I love all my kids. We always stress that we are family." 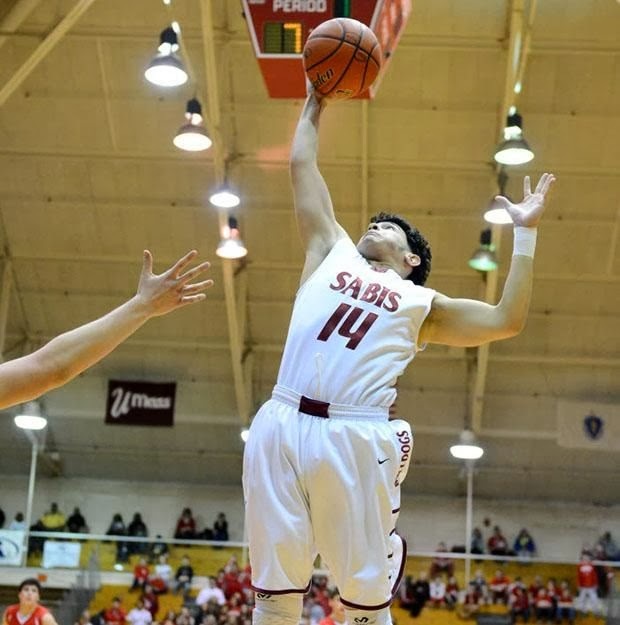 Zayas joined the Sabis basketball team as an eighth-grader and in five season played in seven playoff games at the Curry Hicks Cage. During his eighth-grade season, Sabis defeated Hoosac Valley in the Division II championship en route to a state championship. In his freshman season, Zayas again returned to Cage and won the Western Mass. Division II championship, this time not as a bench-warmer behind Sabis 1,000-point scorers Andre King and Kamali Bey, but as catch-and-shoot role player.